Keep things light on the duty belt while preserving a professional look. Blackhawk! constructs this Expandable Baton Duty Carrier from a synthetic nylon laminate for lasting service life that is guaranteed to withstand daily wear and tear. Crafted from five layers of material, the holder serves as a slick carrier with a polished leather-look in plain or a basketweave pattern. Its polymer core serves to maintain its tough and sturdy frame throughout active work, while a special finish counteracts blood-borne pathogens. 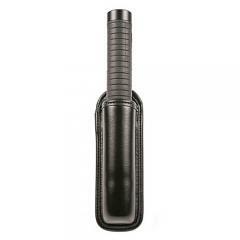 Demand nothing but the very best for your expandable baton and trust in Blackhawk! 's fine line of duty gear!